This post has been updated for newer versions of Chrome. One of the best things about using Chrome (or Firefox) instead of IE is that if things start going badly with those browsers, you can completely remove them from your system and re-install them. First thing to do: Try to ‘reset’ Chrome. Click on the arrow to the far right (see above). The Reset dialog pops up(see below). Click the Reset button. Wait while Chrome resets. When it’s done, close Chrome and re-open it. If the above does not solve your problems, keep on reading! If your problem is caused by corrupted Chrome files, the above won’t help. But don’t worry, there are more than one ways to fix a flaky Chrome installation. Here’s another way, and while it’s more work to fix Chrome this way is almost guaranteed to fix most any problem with Chrome. We recommend you use a good uninstaller to remove chrome – like Geek Uninstaller or Revo Uninstaller. If you don’t have either, you can download the free version of Geek Uninstaller from here. Use Geek, Revo or another trustworthy uninstaller to completely uninstall Chrome. 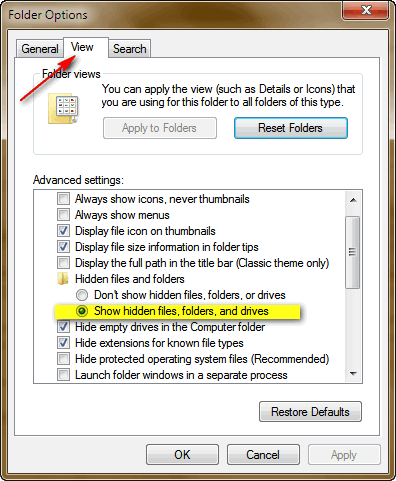 Make sure that “Show hidden files, folders, and drives” is ticked (selected). See the folder ” Google ‘ in Users/**your user name**/AppData/ Local above? Good. Now right-click on the Google folder and choose “Delete” Yep that’s right – delete it. 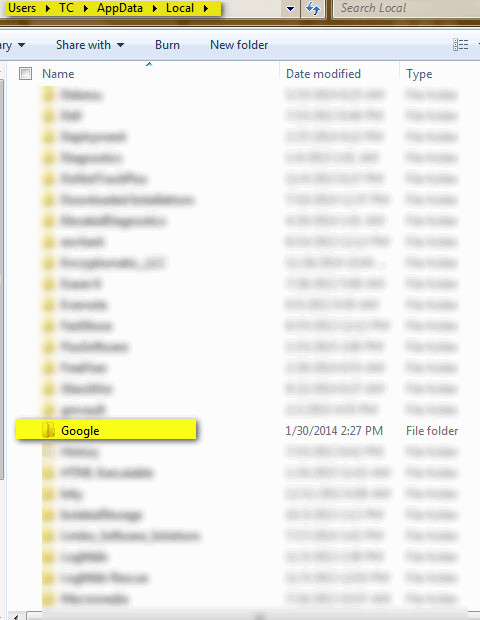 Next… look in C:\Users\**Your user name**\AppData\Roaming and look for a folder named Google. If you see it, you’ll need to right-click on it and delete it too. And after you’re done checking for and removing the Chrome folder from both of those locations, you’ll need to re-start your computer. After you’ve restarted your computer, ,click here to download and install Google Chrome. If you exported them to an HTML file, import them from the HTML file. Once this is done, you will have to reinstall any extensions you want. You may find that you can simply re-enable many or most of them. If some of your extensions are missing, simply re-install them. Once you have all your bookmarks and extensions they way you want them, you’re good to go. Big Discount On Computer Care & Repair for Our Friends 60 and Older! Get more information about Cloudeight SeniorPass here. Luckily, if you sign into Google, all your bookmarks remain. But only if you have hove Sync turned on. Many people don’t have it turned on. Additionally, backing up your bookmarks by exporting them allows you to import them directly into any other browser.